Welcome to the Bordeaux Bungalow. This very nicely done suite offers plenty of room to move in its 1200 sq.' 2 bedroom area. 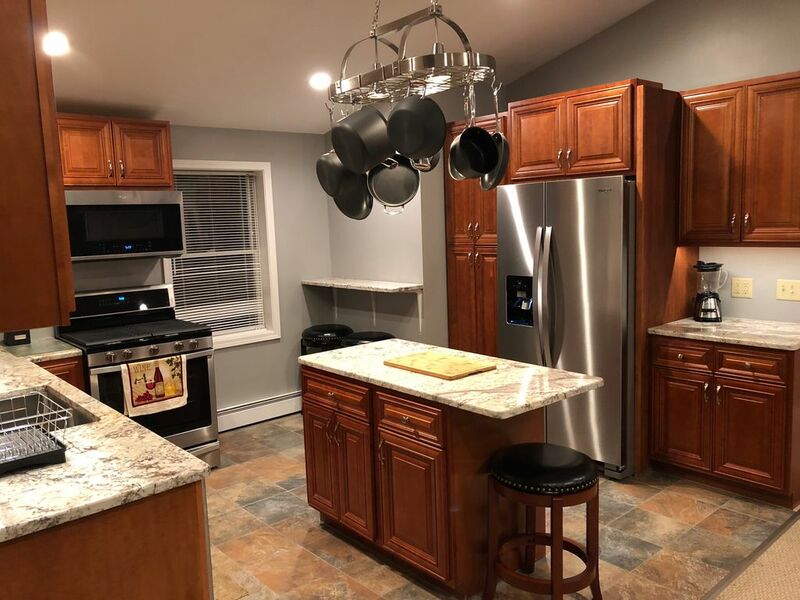 The property is less than 20 years old and has already had considerable upgrading in terms of a brand new kitchen ( cherry cabinets, granite countertops, porcelain floor ) and bathroom ( granite and tile ). The upgrades were just completed in September 2018. The authentic rustic bedroom furniture is very inviting. Besides the very roomy interior, there is also plenty of room to move outside. There is more than ample parking in the front or behind the property. The location is also fabulous. It is in Ellicottvilles beautiful village, but has plenty of privacy even though on a main road. It is located on the second floor. Thank you for considering being a guest at our property. Whether you are skiing, boarding, biking, or just taking in the great feel that Ellicottville has, it is a great place to be. We have had several rental properties in Ellicottville over the years, and do our best to help make your stay a better one. You will always get a clean, well thought out place to stay. Very comfortable beds so that you can sleep well while you are out of town, fully equipped kitchens, and very comfortable surroundings. Most guests return multiple times after they have rented from us once. We would love the opportunity to help make you just as satisfied. Hope to hear from you soon! Freshly made beds with towels folded on beds. Enough for 6 people. If you have 8, you must bring additional for the last 2 people yourself. Fully equipped kitchen with all needed. Our dining room table is set up for 6, with an expandable leaf and two more chars for 8. Spectrum TV and Wifi Internet provided.